How are you under pressure? Are you completely in control, calm, and collected? Or maybe you resort to slapstick antics. If you're a Lucille Ball type then you're probably a fun person to watch in times of trial. There are certain things modern things that we would have loved to watch Lucy do. We've struggled with self-checkout every single time we've tried it. We've tried not to cry in irritation after trying to plug in our phones in the middle of the night only to unplug the extension cord. Wouldn't it be great to watch Lucy try and deal with the "unexpected item in the bagging area alarm" or trying to find the right code for bok choy? And oh goodness, we can't imagine how much chaos would happen if Lucy got ahold of her friends dating ap. Okay, maybe these modern problems wouldn't be quite as good as the classic episodes but we're sure the iconic redhead would bring our everyday struggles to hilarious levels! This licensed costume highlights the chaos of the classic chocolate episode that everyone loves. 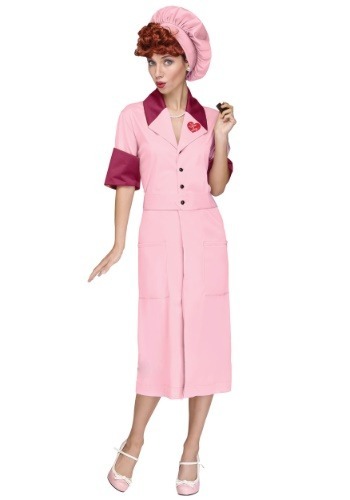 The pink dress has buttons up the front with pockets on the skirt. 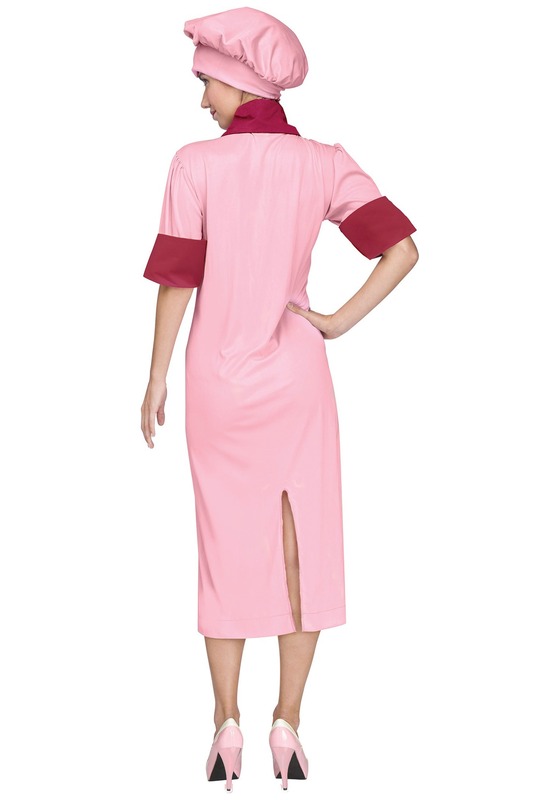 The back of the skirt has a slit to make running around like a chicken with your head cut off easier than ever. The label has a shiny maroon collar with the "I love Lucy" icon underneath. Top off your look with the included chef hat and people will instantly recognize your iconic character. So if you'd like to become a funny icon for a day, this costume will give you a sweet entrance to any costumed affair. It's easy to give your look a boost with a pearl necklace and a curly red wig. And yes, dressing up in this costume is a great excuse to carry around chocolates all night!